Crocus in the Snow begin to pop their little heads out of the ground in early winter. Everyone loves when the Crocuses come out, because whether they are the early species, or the type that grow in spring, everyone knows spring is near! This flower looks like any other crocus flower. It shoots up from the ground and has bulb shaped flowers. They are usually yellow, purple or white. The crocus bulbs shaped flower opens to a wide fan like shape. The leaves that accompany this plant are long, thin and grass-like. The green leaves usually have a white stripe growing o them. 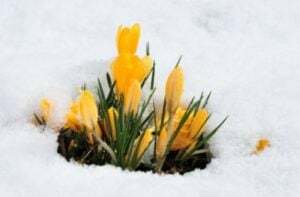 Begin to plant your Crocus in the Snow during the fall. Plant them no more than 3 inches deep. You should also space them about 3 inches apart. Plant them in well-drained soil in a spot that receives a lot of sun. Water them regularly in the winter when they begin growing. If you are having a dry spell, water them often. If you are not in a dry spell, then you only need to water them on an as needed basis. When they fade back into the ground in through the other season, they can tolerate a drought or a lot of rain. If you really like this plant then you will be extremely happy to know that they come back every year. Also they spread very quickly. So you can really enjoy this sunny plant during the winter. If you decide to plant your flower in a flower pot, you can do so, but only for one season. Then you will have to transfer it outdoors to a garden. This is so it will be able to bloom again. If you keep it in the pot, it will only grow for that one season.